After the interminable cold of last winter, I am making a conscious effort to gorge on summer with both beautiful, fresh foods and warm-weather experiences. Already it’s the end of July: I saw my first reddening maple this week and the locust trees are browning out—both surefire reminders that we’re slipping toward darker, colder days. 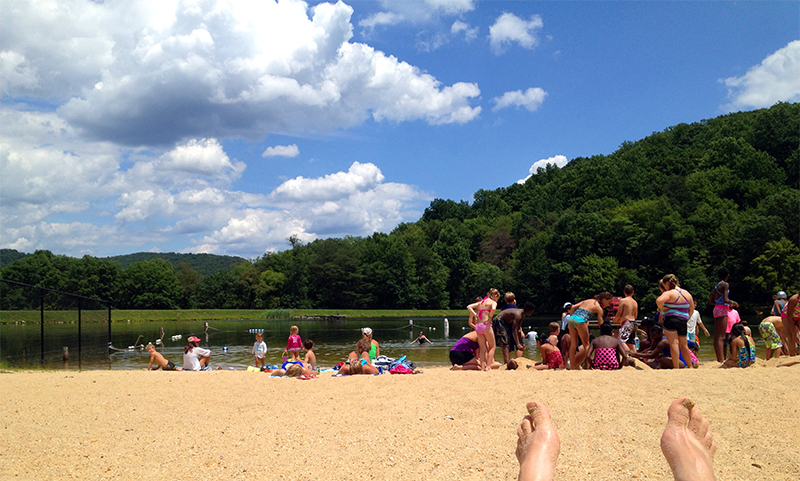 Last week I spent the afternoon at a nearby lake beach, swimming with a friend and her three small children. It was so much fun but what a workout supporting two nonswimming kids at a time in the water while making sure no one drowned! I brought about ten pounds of cut-up watermelon and we polished it off. Sandy watermelon definitely screams summer. Then Friday I took a date and his dog hiking in the mountains. 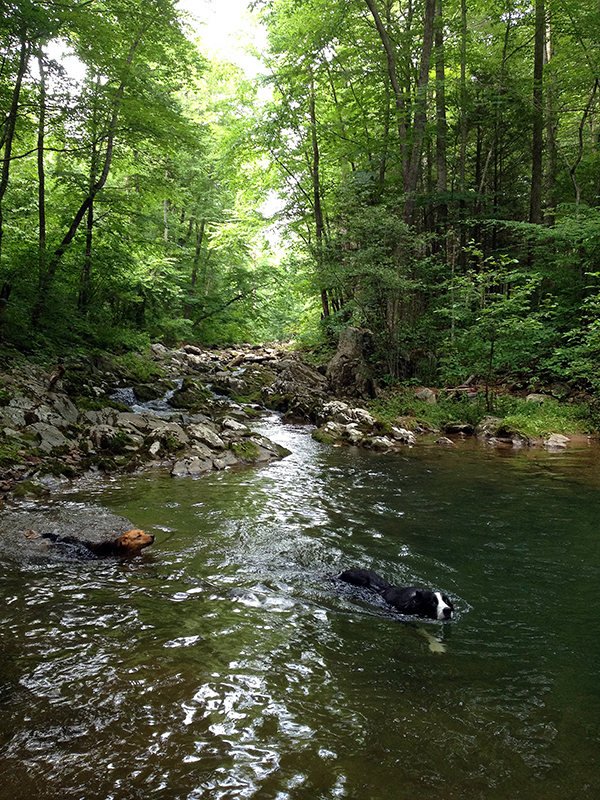 Tuck got to swim and run trails all day with the first female dog he’s spent much time with, and I think he’s in love. 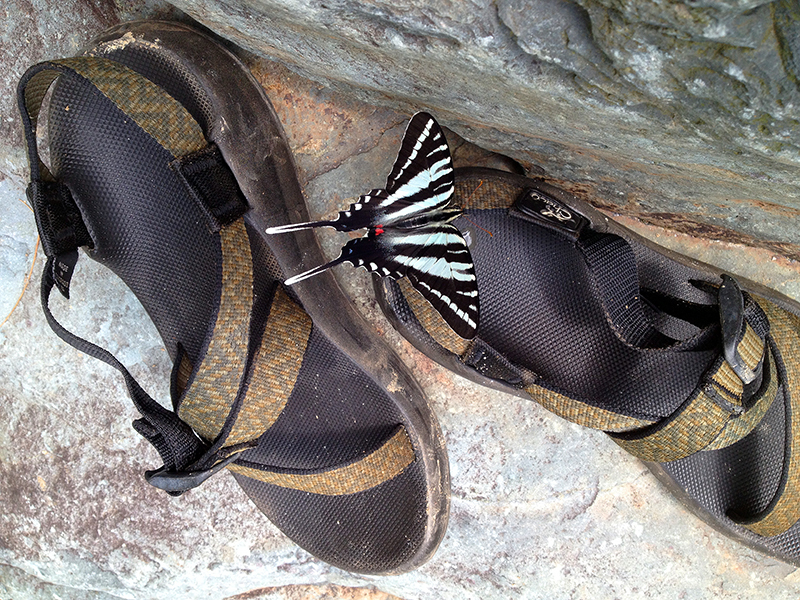 Humans and canines enjoyed a big swimming hole in a shady, mossy glen way up on the mountain, and during our picnic I met a new-to-me butterfly, the Zebra Swallowtail, that flitted around us for hours. It was my favorite colors—pale aqua and coral. It felt great to spend two days in a row swimming in natural bodies of water. Yesterday was cloudy and cool, so I cooked all afternoon in front of the open windows, listening to the bird life outside. I roasted a bunch of cherry tomatoes, which are ripening in overwhelming succession, caramelized onions for about 45 minutes, and blanched the year’s first little “Nickel” green beans. 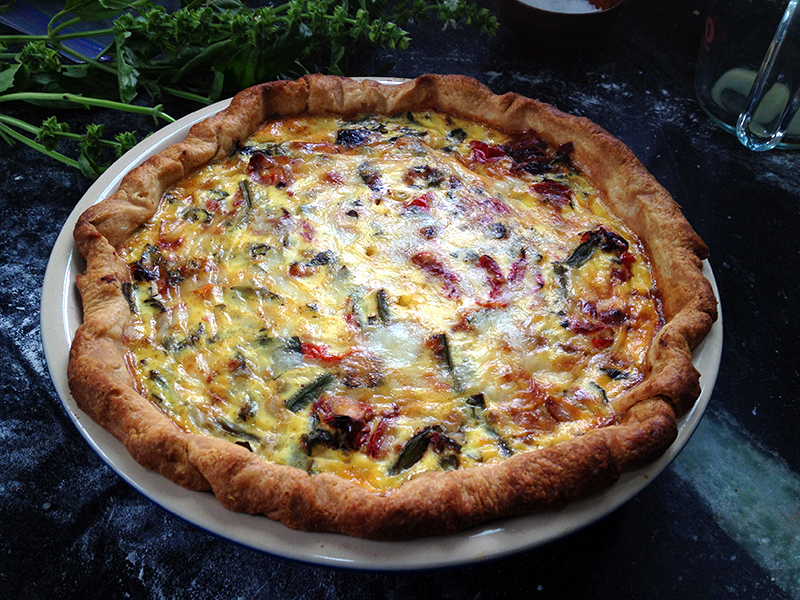 All that plus a handful of chopped basil and some shredded provolone went into a quiche made with my chicken’s own eggs, and it was the best quiche I’ve ever made. And it didn’t even include my usual bacon or sausage! Spin flour and salt in food processor, then add butter and process to coarse crumbs. Dump in all the ice water and then—here’s where it goes against other recipes I’ve used—process regularly for about 30 seconds. It will feel like you are overprocessing, but the crumbs will come together into a perfectly smooth dough right at 30 seconds. Stop as soon as that happens, take out, shape into a disk and chill. Overnight is recommended but I just did it for an hour and it was still okay. Then roll out, dock, and blind bake for 15 min at 450 degrees. Cool, fill and bake again with whatever you want in it. 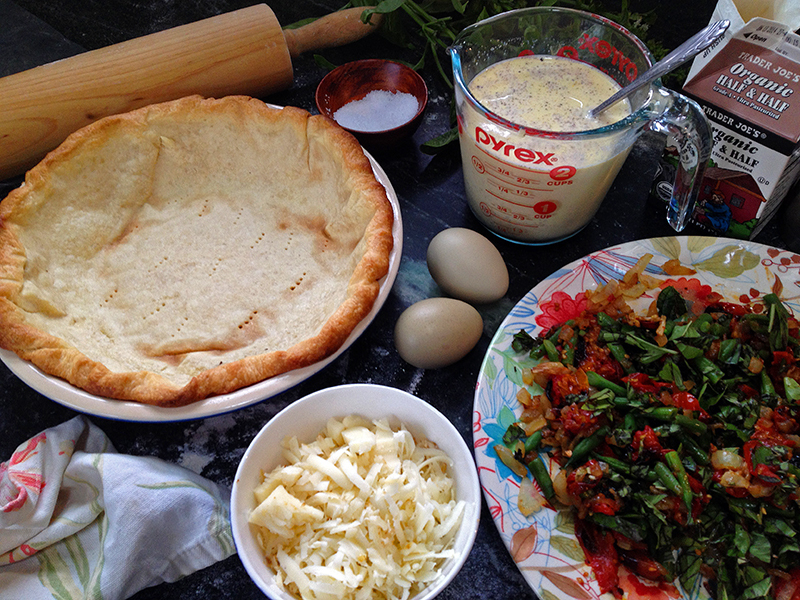 Easy—and a life victory to have finally lit upon a recipe and technique that worked well! 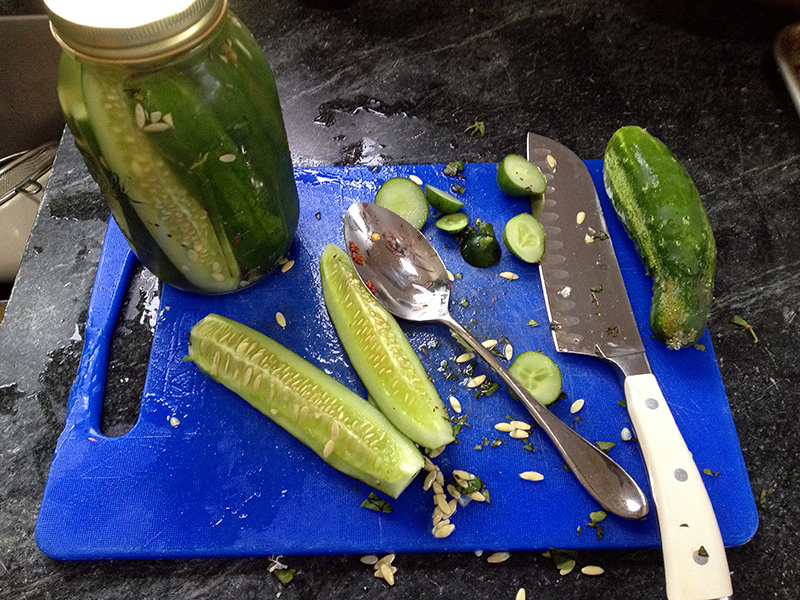 While the quiche was baking I threw together a couple of jars of refrigerator pickles. We have entered the time of year when it’s hard to keep up with the garden’s output, but I love the challenge of having to turn tons of produce into meals. Speaking of which, my garden/kitchen task today is to shred and freeze squash. I think I will also attempt a savory zucchini bread—the weather is so cool that it’s a good weekend to have the oven running! And then maybe, hopefully, my dog and I will find our way to a river. Because it’s summer, and the season for swimming. 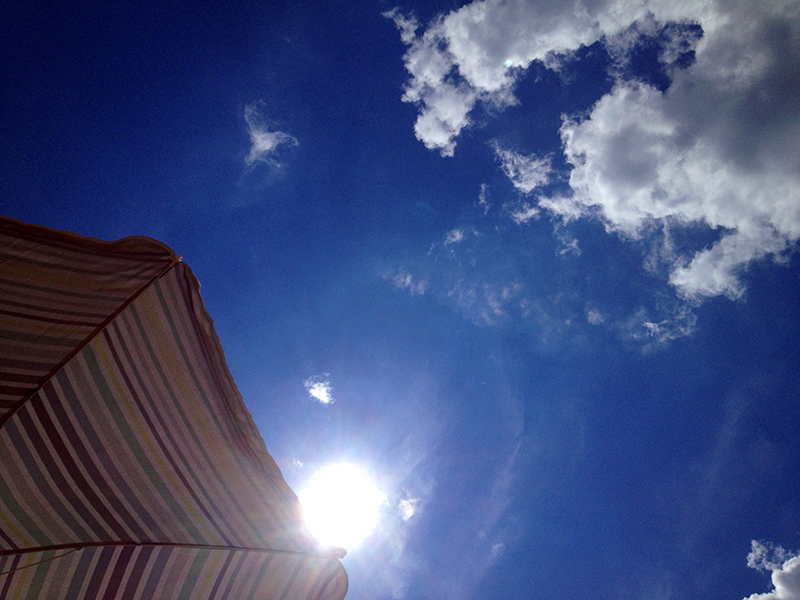 You are currently reading Summertime at Bonafide Farm.